Alex Funk finished tied for second on the Eagles in scoring during the regular season with 31 points (Photo by Helen Nelson). Rochester Lourdes seemed on the verge of bumping off No. 1-ranked St. Thomas Academy, but Eagles coach Josh Spaniol wasn’t altogether comfortable with what he was watching. “I’m not a run-and-gun kind of guy,” Spaniol said. No, Spaniol is the sort of guy who sprinkles the word defense into most every sentence at this time of the year. During that Feb. 8 game against the Cadets late in the regular season in Mendota Heights, the Eagles showed some surprising offensive might. Meanwhile, St. Thomas Academy exploited some gaping holes in the usually airtight Lourdes defense. The Cadets, who had trailed 3-1 after the first period and 5-3 late in the second, eventually prevailed 6-5 in overtime. No. 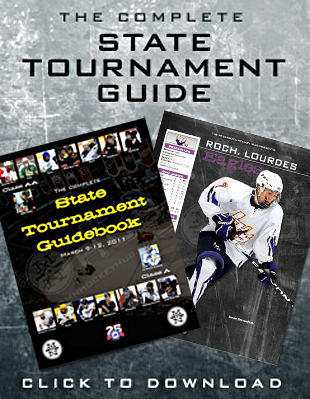 3 seed Rochester Lourdes (24-3-1) faces another potentially explosive offense when it opens the state Class 1A tournament at 1 p.m. on Wednesday, March 9, against unseeded Hibbing/Chisholm (17-9-2). “This matchup is very intriguing,” Spaniol said. “We don’t know much about them, they don’t know much about us. We’re trying to get a little scoring report on them from a couple of different guys. Rochester Lourdes’ defensive philosophy centers around senior goaltender Nick Heimer, who has started all 28 games and has a 1.72 goals-against average and .915 save percentage. 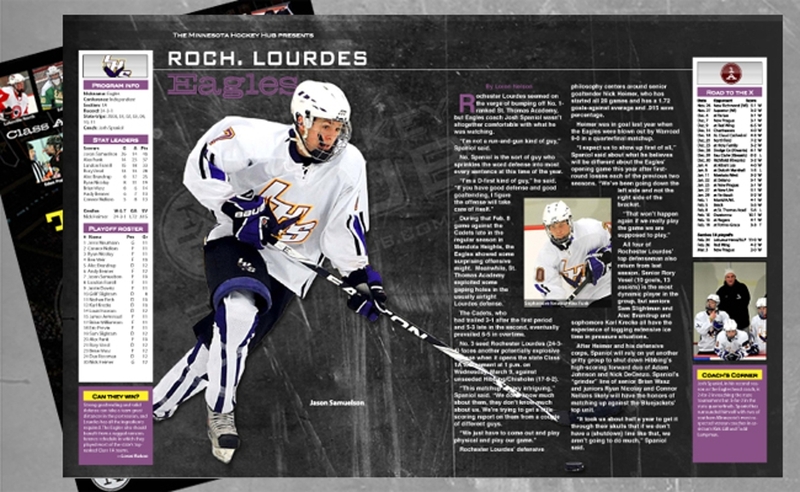 Heimer was in goal last year when the Eagles were blown out by Warroad 9-0 in a quarterfinal matchup. “I expect us to show up first of all,” Spaniol said about what he believes will be different about the Eagles’ opening game this year after first-round losses each of the previous two seasons. “We’ve been going down the left side and not the right side of the bracket. 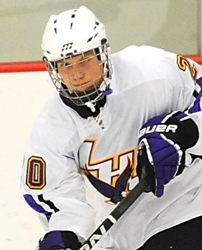 All four of Rochester Lourdes’ top defenseman also return from last season. Senior Rory Vesel (10 goals, 13 assists) is the most dynamic player in the group, but seniors Sam Slightman and Alec Brandrup and sophomore Karl Krecke all have the experience of logging extensive ice time in pressure situations. After Heimer and his defensive corps, Spaniol will rely on yet another gritty group to shut down Hibbing’s high-scoring forward duo of Adam Johnson and Nick DeCenzo. Spaniol’s “grinder” line of senior Brian Wasz and juniors Ryan Nicolay and Connor Nellans likely will have the honors of matching up against the Bluejackets’ top unit. “It took us about half a year to get it through their skulls that if we don’t have a (shutdown) line like that, we aren’t going to do much,” Spaniol said. Strong goaltending and solid defense can take a team great distances in the postseason, and Lourdes has all the ingredients required. The Eagles also should benefit from a rugged nonconference schedule in which they played most of the state’s top-ranked Class 1A teams. Josh Spaniol, in his second season as the Eagles head coach, is 2-for-2 in reaching the state tournament but 0-for-2 in the state quarterfinals. Spaniol has surrounded himself with two of southern Minnesota’s most respected veteran coaches in assistants Kirk Gill and Todd Lampman.